ITEM: 2012 Nike Dunk High Premium SB " FRANK KOZIK " (steel green/olive khaki/safety orange/cargo colorway) - Men's US size 10.5. INCLUDES SPECIAL EDITION PROOF PAIR MILITARY BAG PERSONALLY SIGNED BY FRANK KOZIK - ONLY DISTRIBUTED AMONGST FRIENDS & FAMILY! CONDITION: Brand New - Deadstock - Never Worn. ADDITIONAL NOTES: This rare colorway is impossible to find in this size and condition. 580 West Lambert Road Unit I, Brea, CA 92821. 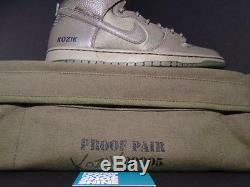 The item "Nike Dunk High Premium SB FRANK KOZIK AUTOGRAPH SIGNED OLIVE GREEN MILITARY BAG" is in sale since Tuesday, August 30, 2016.